The rose garden to the right of the walkway is complete and ready for planting! 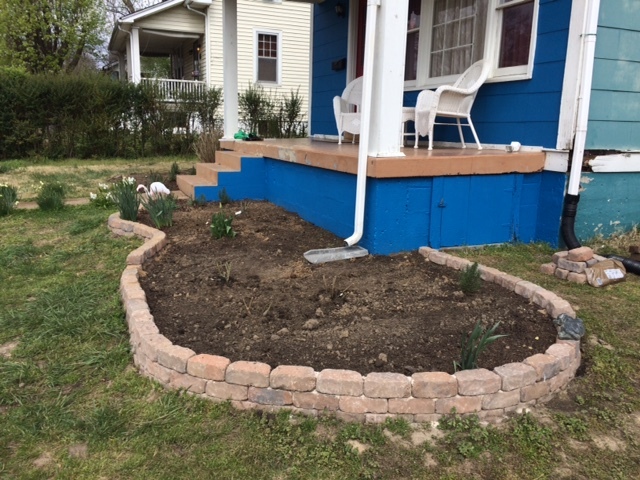 On the first day of my vacation, I finished the edger on this side of the garden and planted my bare-root roses from David Austin. Actually, I replanted them. I had planted them quickly last weekend just to get them in the ground, but I needed to (carefully) remove them and replant them at the correct level in the soil. The bud union should be at soil level or just below in our zone. I took the opportunity to make the holes larger, mix in more of the amended soil, and give them a little water. You can see that the back edge of the wall and the far left side have an extra course of bricks. I chose not to continue this course all the way around. It made the right end of the wall a bit unstable, so I chose an irregular look instead. I am thinking of putting some lighting along the lower part of the wall, just for funsies. I got all six of my bare root roses planted. You can see them, barely, in the photo below – they look like green and brown sticks sticking out of the soil. 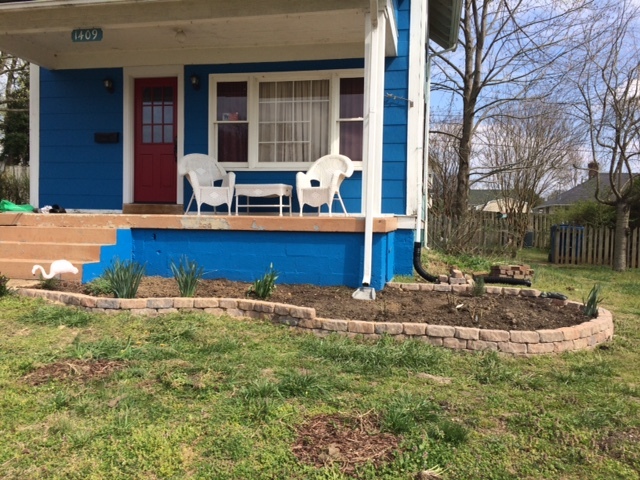 The green in the bed are leftover daffodils, a few tulips that are nearly ready to bloom, and the rosemary that I have planted as companions for the roses. And resting on the wall is a little monument to my dear departed kitty Marie. 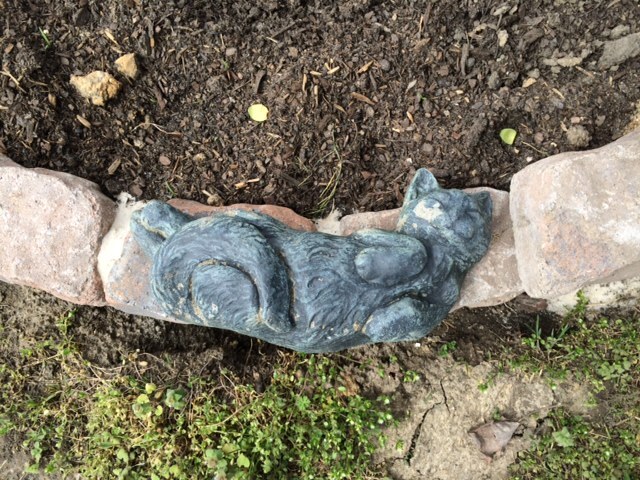 This little sleeping kitty used to live in the now defunct butterfly garden, but she prefers sleeping on the wall in the spring sun. There has been a freeze warning issued for our area for tomorrow night. I plan to bring in my potted roses, just in case. Next week, when the weather warms, they will move to their permanent home in the new rose garden.